The 1923 New York Yankees season was the 23rd season for this American League franchise and its 21st season in New York. Manager Miller Huggins led the team to their third straight pennant with a 98–54 record, 16 games ahead of the second place Detroit Tigers. The Yankees moved into the now famous Yankee Stadium. In the 1923 World Series, they avenged their 1921 and 1922 losses by defeating the New York Giants in 6 games, 4 games to 2, and won their first World Series title. Yankee Stadium in 1923, about 2 weeks before opening. The Yankees began their first World Championship Season on April 18 as they opened Yankee Stadium. Babe Ruth christened the new stadium, with a home run in the Yankees' 4–1 victory over the Boston Red Sox. 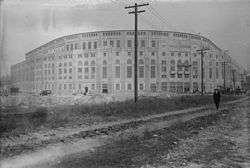 The stadium would later be called "the House that Ruth Built". On May 5, the Yankees beat the Philadelphia Athletics 7–2 at Yankee Stadium to regain first place, the Yankees would never fall back in the standings for the rest of the season. Babe Ruth set a Yankees record for highest batting average in one season by hitting .393. Ruth also finished the season with 41 home runs and 131 RBIs. Ruth's average was not enough to win the batting title, as Ruth finished in second place to Detroit's Harry Heilmann who batted .403. Ruth reached base safely 379 times during the season. Weintraub, Robert (2011). The House That Ruth Built: A New Stadium, the First Yankees Championship, and the Redemption of 1923. Little, Brown and Company. ISBN 978-0-316-08607-3.